While banks like Bank of America and Citigroup dominate the headlines when it comes to the release of yesterday's stress test results, the smaller but more traditional consumer and commercial bank Keycorp posted a robust Q3 2012 Tier 1 common capital ratio of 11.3, flat its 2011 level. The main purpose of the Fed's stress tests is not to look at actual capital levels, but rather to examine the how these institutions would fare if the domestic and global economy experienced another downturn similar to several years ago. 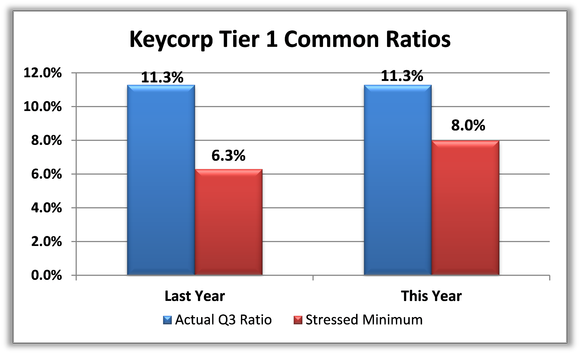 In the "severely adverse" economic scenario, which included a sharp contraction in U.S. GDP coupled with 12% unemployment and a 20% decline in real estate values, Keycorp's Tier 1 common ratio only fell to a minimum of 8%, an improvement of 170 basis points from last year's stressed ratios. While banks with significant capital markets operations are exposed to large counterparty risks, the impact of an economic deterioration on a traditional lender like Keycorp is much more straightforward. 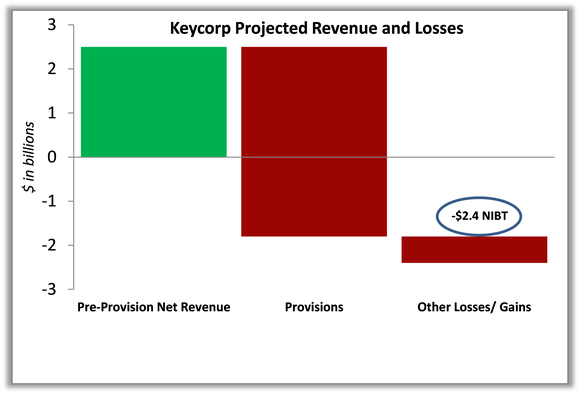 Over the nine-quarter doomsday scenario, the Fed projected Keycorp to see its Pre-Provision Net Revenue (essentially a measure of operating profit) fall to $2.5 billion and Provision for losses to creep up to $4.3 billion. 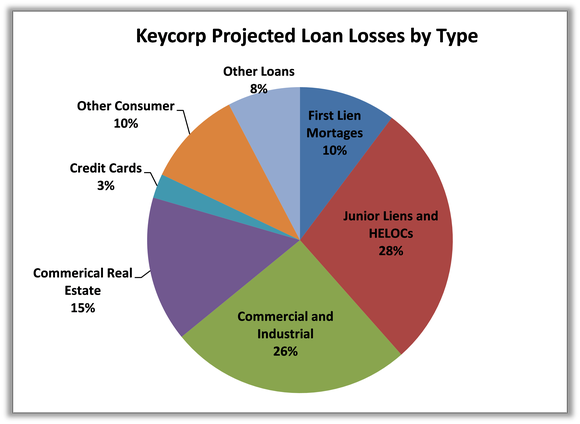 As an American lender, Keycorp remains very closely tied to both the American consumer and domestic business climate. Because of the bank's heavy exposure to real estate, the hypothetical decline in real estate values is one of the main drivers of the simulated losses. Although the bank been profitable for three straight years and strengthened its capital ratios, Keycorp still trades slightly below its tangible book value and may be well-positioned to continually return capital to shareholders. With big finance firms still trading at deep discounts to their historic norms, investors everywhere are wondering if this is the new normal, or whether finance stocks are a screaming buy today. The answer depends on the company, so to help you figure out whether fellow regional bank BB&T should be on your radar, I invite you to read our premium research report on the company today. We'll fill you in on both reasons to buy and reasons to sell BB&T, and what areas BB&T investors need to watch going forward. Click here now for instant access! The article Here's How Keycorp Fared in the Stress Tests originally appeared on Fool.com. David Hanson has no position in any stocks mentioned. The Motley Fool owns shares of Bank of America, Citigroup, and KeyCorp. Try any of our Foolish newsletter services free for 30 days. We Fools may not all hold the same opinions, but we all believe that considering a diverse range of insights makes us better investors. The Motley Fool has a disclosure policy.